We are the Pitshanger Poets. We are a loose, eclectic group that has been celebrating poetry since 1985. We hold readings, we publish a slim compilation volume and have been known to host competitions, but the mainstay of the group is our weekly workshop, held at Questors’ Theatre, Ealing. You are welcome to join us. We meet at 8pm every Tuesday in the library at Questor’s Theatre, Mattock Lane, Ealing, generally to read our own work. Please bring a poem, please bring some copies and be ready to read and discuss it in an open, convivial atmosphere. The Pitshanger Poets comprise young and not-so-young, published and un-published. We enjoy all forms of poetry and are not wedded to any one form or tradition. The aim of the group is to improve your work and support your poetry ambitions. 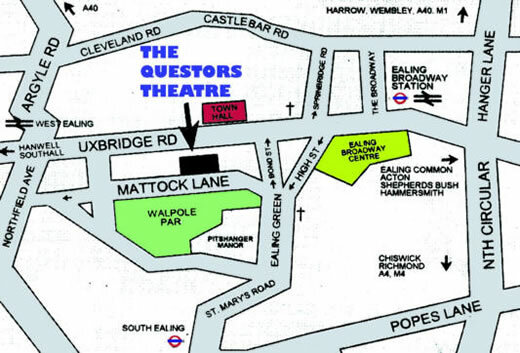 Questor’s Theatre is at 12 Mattock Lane, Ealing W5 5BQ. The theatre is an eight minute walk from Ealing Broadway station (on the Central and District lines, and also national rail) and about 15 minutes’ walk from South Ealing station (Piccadilly line). Bus routes 83, 207, 427, 607 stop by the Town Hall, routes E2, E7, E8, E11 stop on New Broadway, and route 65 stops on High Street – all 3 or 4 minutes’ walk away from the theatre. The following route information is accurate to the best of our knowledge, but please check the TfL links above for up-to-date information. We have a small car park, and there is also free parking opposite us on the south side of Mattock Lane, along Walpole Park (but there are parking restrictions immediately outside the theatre). So glad to be part of your honourable literary family! If I didn’t live in Canada I’d be basking in words and laughter with your venerable group. I’m hoping that you might have a notion whether the short or long list for your competition has been released. Love to do a small reading with you in the next year or so. I wish you a lovely spring.